As a decent download manager which lets you grab video clips and other files from various sites, JDownloader is known to many internet users. It comes in handy whenever you need to preserve a video for watching later offline or download a file you need from the web. JDownloader provides a seamless experience to add desired files into your local collection with intuitive steps and settings. However, this program seems to be obsolete as it stops maintenance. And also because of no updates for quite some time, it doesn’t make users feel safe anymore, not to mention that it’s not compatible with recent Windows and Mac platforms. If you only know JDownloader or not able to find one better than it, then you may find the better JDownloader alternatives as this post continues. Find the guideline as below. Video Keeper being mentioned first is one of the best JDownloader alternatives. It provides all the features you desire to download, capture and manage videos. You can easily download videos from sites like YouTube, Vimeo, Dailymotion, VEVO and many more without quality loss. In addition, you are free to convert downloaded video files into MP4, FLV, WMV, MOV, 3GP, MPEG, etc. Formats. With this amazing conversion function, you can download online videos and then play or enjoy them virtually anywhere you like. As for the interface of this alternative to JDownloader, it’s much better for offering an easy-to-use interface that even newbies know how to use it without learning. In addition, it can also be used as a screen recorder, video editor, and media player. You can click the button below to download the version you need and then check the steps about how to use it to download online videos. Install Video Keeper and launch it. You will see the intuitive interface as below. To download a video, you can first navigate to find the video you wish to download and copy the URL address from the web browser and then click Paste URL to download the video via URL. You can also go to “Detect” tab and use the built-in browser to search for the video you need and then click the Download button that appears beside the video to download it immediately. If you want to download many videos, you can also enable the advanced detector in Settings. By doing that, any video you open in the web browser will be added to the downloading list automatically. All the downloading progress will be shown as Downloading and Completed. In the Downloading menu, you can pause or resume the downloading any time you like. And all the downloaded videos can be found in the Completed menu. You can play the video, change its name, add it for conversion, etc. This tool has been regarded as a fast download manager that empowers users to facilitate built-in accelerator for downloading videos over internet. Despite the essential download function which covers just any files on web, it also goes advanced by providing task manager, download scheduler and more. However, since the coverage includes videos, doc, audios and many more, it’s not specialized in downloading videos and therefore some functions seem redundant. The interface is also a bit sophisticated for novice users. Still, it works really fast on downloading files from web, which is not available in every similar downloader tool. Just follow the steps below to download video with this Jdownloader alternative.In order to have a deep understanding on this tool, you shall proceed with the following steps. First and foremost you have to get the program on your computer by installing it from the official website. Once you have the tool ready, you can go and find your favorite video which you are planning to have downloaded, and once you start playing its content, then you will be shown the emerging Download This Video button that you will see popping up, which you just need to click for continuing the process. Alternatively you can also put in the URL into the interface of the tool directly via the Add URL button. At this point, choose the preferred video quality from the available list and set a folder to save the video. You can also alter all the necessary options such as giving any speed limitations next to the Options sub menu under the Downloads tab. Once you have everything prepared, just click the Start Download button to begin the downloading, so your content will instantly be saved afterwards on your drive of your computer. This tool claims to be the pioneer of download manager revolution. With years of development, this freeware is devoted to downloading video/music streams from mainstream media sites. You could easily find its official page via Google and access it. Moreover, it provides more than one option to download videos – you could either download a clip when streaming it on browser or input the URL into the program interface to fetch it. Though the interface is a bit obsolete which does not sound appealing, it does work well on Windows platform. Orbit downloader now supports IE, FireFox, Opera and Maxthon browsers. Check about the way to download online videos with Orbit Downloader below.In case you want to have this program work for you, have a look below. Note: this software has not been updated for a long time, please check it carefully before you start using it. In the beginning you firstly need to put up the Orbit Downloader on your computer. Once you have its installation, you can navigate to the small icon of the downloader program on the system tray and click to open it. From the drop up window select the Grab++ function which will take you automatically set up that the program will be activated for downloading events. After you have the program actively available, then locate the video in your browser which you wish to download, and once you open the URL of this video and initiate playing the content of the video, then the corresponding URL will automatically appear in the window of the Grab++. Once you can see the link in the window of the Grab++, you are able to press the download button so that the grabbing process will start and the video will be downloaded and saved on your computer instantly. Though it looks like another file download manager, it performs in a way that’s different from the other tools being reviewed here. It works as downloading all images and videos on a specific page. As this tool will return all downloadable media files in a list to you, you may need to select the specific video clip from it and uncheck the rest. Though it’s a bit roundabout, you will find it surprisingly beneficial when downloading several images on a page (e.g., wallpaper site, etc). Although it’s not a pure download manager, Download Them All deals with most of the video clips you can stream on browser and can add them to download efficiently. DownThemAll is an extension for Firefox so make sure you have Firefox downloaded. Open Firefox and search for “Downthemall” among the available add-ons. The add-on will be installed after restarting Firefox. Open the webpage in Firefox that contains the video or picture you want to download, right-click the page and from the list of options select “DownThemAll”. You will now have to filter which files you want to download from the webpage. You will see two tabs; “Links” and “Pictures and Media”. “Pictures and Media” contains all the elements that are visible on the webpage but only contains thumbnails of the content. To download full sized pictures and videos, locate the desired content in the “Links” tab. Tick the files you want to download and hit “Start”. The files will be saved to the specified folder. 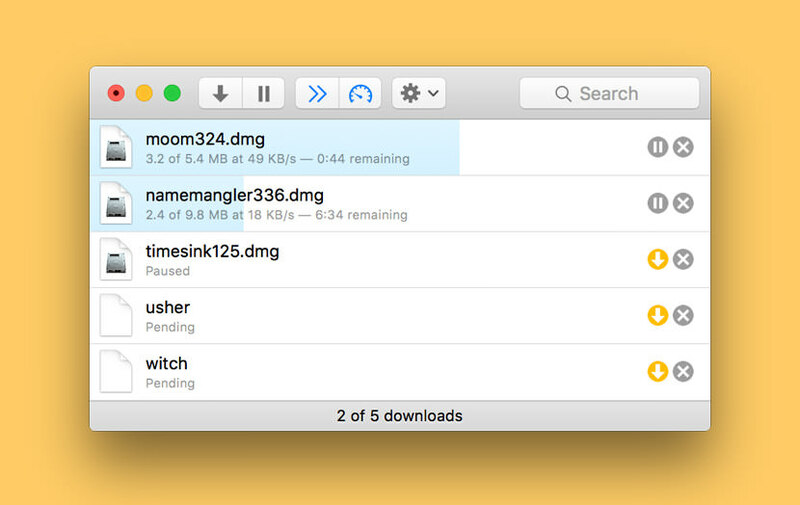 The name sounds irrelevant to downloader, but FOLX by Eltima is a niche torrent client. It provides two ways to download files either via torrent or URLs. And the latter way is definitely suitable for downloading video clips from YouTube and more video sites. Though FOLX is considered as a general file download manager, it has a function to download from YouTube specially, making it more friendly for users to get video clips from web. After you have successfully downloaded video files within this tool, you’re able to re-arrange them with tags or simple drag-drop. And if you upgrade to pro version, you could schedule a download task to grab videos at specified time. There’re also speed control, iTunes integration and faster downloading speed available in Pro version. Grab the newest version of FOLX, Click Here!.Install the program to your computer and launch it once installation has finished successfully. Prior the download, set the downloaded file location by changing the default set-up.The path is determined based on the first tag that you have made. Set-up your own if you want to keep your files together. After that set the download action if it is an automatic download, Manual or scheduled. Open YouTube and find the video that you wish to download. Next, paste the video link in two ways: Click the “+” sign to iniate the downlaod or directly paste the “URL” then press “Enter” from your keyboard. That way the tool will automatically locate and download the video. To check the downloaded file simply go to the default or Set-up location prior the download. You can also use “Spotlight” to directly search for the video name. All videos downloaded are searchable in spotlight. This program has probably the simplest interface among the similar tools. It works directly both on your browser and desktop. It lets you download files via URL by dragging it to the interface and there’s also option to detect videos on playback page automatically. In this way, you can let the program grab any video being streamed on your browser without sparing time to arrange download tasks. And if you prefer, you could also set the rules for automatic download; for instance, download videos in FLV on YouTube only. Moreover, it has a considerate setting to store the URL of videos or other files for downloading them later. The free trial has some limits while the Pro version will cost $6. And here are the easy method to grab videos on Mac with it. 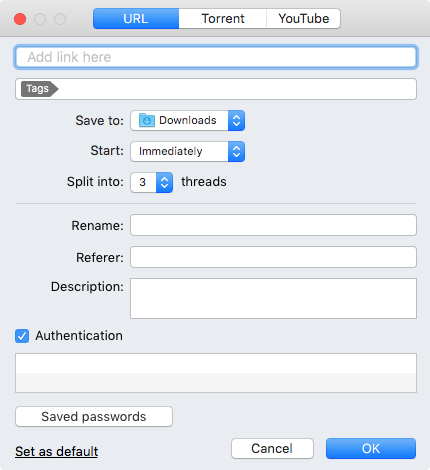 Download and install Leech on your Mac Click Here! After installing it, launch the program if it has not done so automatically. Open YouTube and search for the video you want to download. Start playing the video and highlight the video’s link located in the address bar of your browser. While keeping your left mouse button held down, drag and drop the link address to Leech’s interface. Once you input the needed URL, then the Leech tool will start to analyze and download the video from the given URL immediately, so you just have to wait until it is finalized to have it offline stored on your hard drive immediately. In summary, to find a better alternative to replace JDownloader, we have evaluated several useful tools which have ongoing updates and amazing features. Every tool has free trial or can be used for free permanently. However, as you can see from the article most of these tools have different ways of doing the downloading and also their ease of use differs, therefore you shall decide on which you need the most. In any way, the mentioned AceThinker tool will bring you great you and we warmly recommend you to have an eye on it as a suitable alternative. If any other great alternative to JDownloader is not mentioned here and you happen to know it, please share your idea by leaving a comment. Thank you!